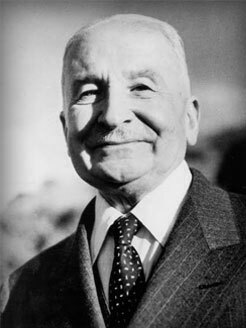 Today is the 40th anniversary of Austrian economist Ludwig von Mises’ death. I can’t emphasize enough how much Mises has been influential on my way of looking at both economic and social interactions. When I compared his writings to my day to day life as a banks analyst, everything made so much sense… I’ve read several of his books, of which Human Action is one of my favourite. I found myself in agreement with 99% of what I read in it. Believe me, this usually never happens. He was a true believer in freedom, and was mocked during several decades for predicting the fall of the Soviet Union. A great economist. PS: You can read more about Mises on Free Banking and on the Mises Institute website (also here).